Ceramika Paradyż is one of the largest Polish producers of ceramic tiles, which exports its products to more than 50 countries around the world. 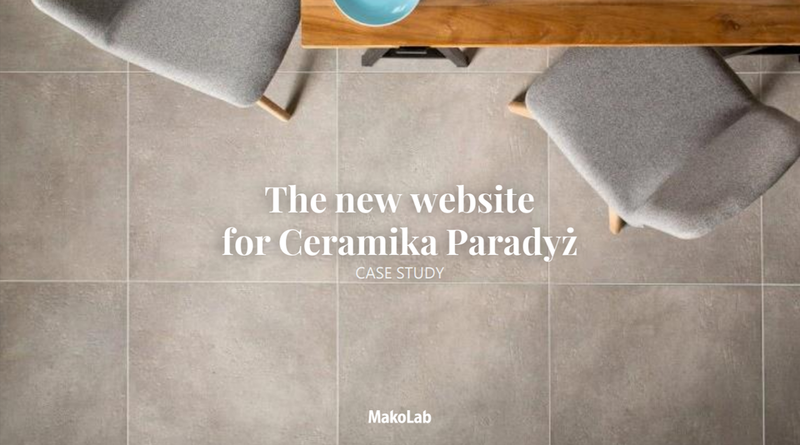 The main challenge faced by MakoLab in providing this solution was the creation of an intuitive tool that would allow website users to efficiently navigate through the broad and attractive offers of the producer from Paradyż. These improvements came in response to the highlighted expectations of research participants, carried out by Ceramika Paradyż. Undoubtedly, by having such knowledge straight from it’s potential users, the creators of the site were able to focus on very specific proposals for layouts. The intuitive navigation system allows customers to not only find interesting tile designs, but to also explore entire collections and other inspirational materials, such as ‘how-to’ content about arranging stylish interiors. The mechanism of the website allows a user to easily move between available information and other functionalities at any time. Moreover, these optimisations have been geared towards minimising the time it takes for users to make a purchase decision. The new site provides a comprehensive gallery of inspirations that anyone can easily adjust to meet their own preferences. The listings also have an advanced filtering mechanism adapted to the user's search method. Thanks to this, those who know exactly what they want can find collections and products that meet their expectations quickly. In addition, a sales network map is available on every subpage, allowing the user to easily locate the nearest selling point and its available products. The new site has been put into use in 4 language versions. It can be used in Polish, English, German and Russian, which is of great importance due to the large number of markets that offer Ceramika Paradyż's products. Thanks to the involvement of SEO specialists since the initial stages of the website’s development, Makolab has managed to optimise it’s technical aspects, which has, in turn, allowed the site to maintain its previous levels of organic traffic and the search ranking position of the website for it’s important key phrases. Currently, further optimisation works are underway to enable the continuing development and optimisation of content into the future.